The wraps have officially come off the new Nissan Terrano in Mumbai. The SUV is essentially a rebadged Renault/Dacia Duster with more upmarket appointments, for the Indian market. 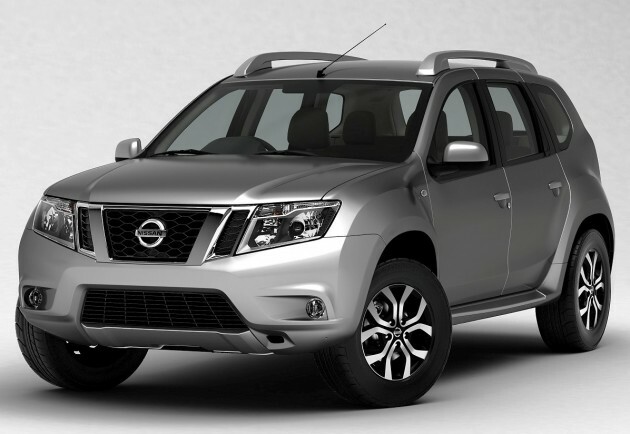 The most obvious change is the Nissan front end, which incorporates a new grille, reworked headlamps, new fog lamp surrounds and bonnet creases that run to the grille. There’re also new 16-inch alloys, darkened pillars, larger tail lamps and a restyled number plate holder. Inside, you’ll find more luxurious trim materials and brighter colours throughout, a steering wheel with silver inserts and cubbyholes on the dashboard. Buttons and knobs on the centre stack are mostly new and have been re-positioned. The central air vents are no longer circular, and there’s a new audio system as well. Reports say some of these changes may make their way on to the facelifted Duster, which is set to make its first appearance at the upcoming Frankfurt show. Set to be built in the Renault-Nissan plant in Chennai (the fourth Nissan to be built in India after the Micra, Sunny and Evalia – that’s the NV200), the Nissan Terrano’s powerplant menu will include a 104 PS/145 Nm 1.6 litre petrol and a 1.5 litre diesel in 85 PS/200 Nm and 110 PS/248 Nm states of tune. The more powerful diesel engine is coupled to a six-speed manual; the rest make do with a five-speed manual. The Duster’s optional 4WD system may be offered, too. Reuters reports that the Ford EcoSport-rivalling SUV will start at a price below Rs 10 lakh (RM51,400). The Duster (sold in India as a Renault) sells for around Rs 8 lakh, ex-showroom (RM36,000). Order books will open next month, with sales scheduled to begin in October. We reported back in November that Malaysia is one of the Duster’s potential markets – if it does come here, it’s expected to sport a Renault badge on its nose. I think have to wait for atleast 2 more years? Still the price RM180K. No thanks to NAP. Dacia is low cost car of Renault. So bringing this rebadged Dacia + come improvements to India is good move by Nissan to penetrate the market. Which same can be done here but not sure about the price though. Hm… coming to Malaysia. It could do well, but why carry the Renault badge? They could sell these like hot cakes if it were to carry a Nissan badge… also I prefer the Dacia design, it has the nicest grill, followed by the Nissan version and then the Renault version (which looks odd). Of course, if TC wants to revitalize the Renault brand in Malaysia it makes sense to bring it in as a Renault. It could lead to more sales of other Renault models. The problem with TC is always that they don’t want to bring in cars that compete with each other… so we won’t get a Dacia Logan MCV and Renault Kangoo II Ph 2 (Livina X-Gear/Grand Livina competitor), Dacia Lodgy and Renault Grand Kangoo II Ph 2 (Grand Livina, NV200, …), … though these cars, especially the Dacias could do well if priced accordingly. Cheap, simple technology, ridiculously spacious, and kind of attractive (and not so safe). Kangoo is a fail product from TCM. Malaysian favor for Avanza or Livina rather than it and I don’t think TCM will bring the newer Kangoo to Malaysia anymore. Rather than bring this economical Duster, Renault should bring other more exclusive car like Escape and Scenic. The Kangoo did sell in quite decent numbers, just not good enough. People who did test drive one liked it, it’s a much superior car over the Avanza. The new Kangoo is basically a Scenic with a lower price tag, it could run circles around the Avanza and Grand Livina. Also the Kangoo was here too early perhaps, Malaysia wasn’t ready for an unconventional car. Malaysians do like affordable cars, so the Duster isn’t a bad idea, and it is without competition. TCM won’t bring the new Kangoo in though, I agree. That’s not going happen, sadly. Escape and Scenic sell in too small numbers. What Renault needs is a bestseller. Something that reestablishes the brand and gives potential buyers confidence in terms of workshops and spare parts. If the price is right, maybe can fill niche market. Market outside urban area need cheap, basic SUV to fill gap left behind by Kembara. Plantation companies, smallholders, medium scale farmers need this kind of vehicle. price it cheaper than Fortuner and Pajero Sport, with very basic spec lower than 90k up to fully loaded 130k, I think can sell around 1200-2400 units yearly. Finally, a looker from Nissan. Hopefully TCM can bring it in by 2016 instead of the usual 2019..
Look at the Dacia Duster. It is even better looking. And this isn’t really a Nissan, it’s a Dacia, which means it is using lots of Renault parts (though they are shared with Nissan sometimes). yeah I know.. but it’s not so easy to apply for dealership and the process of setting up 3S centres and showrooms across the country, not to mention parts and the whole shabang.. anyway, Dacia is a relatively unknkwn these parts, so well.. I hope when TC bring it into Malaysia the price is around 60-80k + tax…its suppose to be affordable and good safety. A Nissan that looks nicer than a European car! The world is changing! It’s a European car that was given Japanese make-up. It’s a rebadged Dacia (Renault). Usually it’s the other way round, and it should be. I think it would do well in malaysia sold under the Nissan badge instead of a Renault badge, considering the hero worship we bestow on Japanese marques. Hope is it will be a more budget alternative to the other soft-roaders like the CRV, Tucson, and Sportage…but knowing TC, it wont be any cheaper like the outgoing X-trail. Renault-Nissan owns Dacia. Renault more or less developed the car for Dacia, and is using the Dacia brand not to hurt the Renault brand with low cost cars. In some markets though they use the Renault brand to sell the car, and in some other markets they use the Nissan brand to sell the car. So it’s all internal. Like GM selling one car under different brands. Dacia is like Datsun for Nissan, but it’s for Renault. Finally we have an intelligent set of comments here in paultan (apart from mamamia’s). Comments with constructive criticism, opinions without outright bashing, and people agreeing to disagree in harmony. This is what a civilised automotive-site followers’ comments should be like. TC pls bring this version to Malaysia! There is a fifth Nissan made in India – the Pixo for export – by Maruti Suzuki. This poor kid is always overlooked when people talk about Nissans in India! it’s so cheap in India! This looks so cool !! Despite the fact its was born as an ugly looking Dacia Duster ! The interior look good as well after Japs touch .